“A mother is she who can take the place of all others but whose place no one else can take,” wrote Cardinal Mermillod. 1. Happiness Isn’t Something We Find. It’s Something We Create. A happy life does not construct itself. It takes hard work and perseverance. It takes the courage to find the good in seemingly hopeless situations. A daughter who watches her mother build a happy life will have the blueprint for creating her own someday. 2. It’s Okay To Lean On Others. A strong mother never makes her daughter feel bad for needing help. This allows her to grow into an adult who is not afraid to ask for it. We all need support sometimes. There’s no shame in being human. 3. They Show Them How To Parent With Kindness And Consistency. 4. Have Faith. Things Will Work Out In The End. A daughter who watches her mother react to struggles with patience and faith learns to do the same. A strong mother gives her daughter something to lean on – religion, philosophy, spirituality, or a simple sense of trust in the universe – and teaches her to use it. If it mattered, it would be called “what is.” Strong mothers teach their daughters to find happiness in the present moment, rather than pining for lost possibilities. 6. Being A Woman Is Not Easy. Our world is unfair to women in thousands of different ways. A strong mother teaches her daughter how to navigate the challenges of womanhood with dignity, grace, and integrity. More importantly, she teaches her sons to be the kind of men who value and respect women. 7. Strength And Softness Can – And Should – Coexist. A woman’s emotional intelligence and capacity for empathy is not a weakness. It is a strength. It does not negate her ability to face challenges and overcome obstacles. In fact, it enhances it. 8. The Most Important Person You Can Build A Relationship With Is Yourself. Strong women make it a priority to love themselves. This is hard work. The world does not make it easy. However, a strong mother realizes that it is not only herself she’s doing this for. She is teaching her daughter to do the same. A strong mother realizes that her daughter does not need a man to be complete. She’s enough just as she is. Love is a wonderful thing, but it can be found in a million places that don’t involve marriage. 10. Unconditional Love Is Real, And It Is Powerful. This Can Only Be Taught By Example. When A Mother Loves Her Children Without Condition, She Gives Them The Most Valuable Gift In The World. “My mother wanted me to be her wings, to fly as she never quite had the courage to do. I love her for that. I love the fact that she wanted to give birth to her own wings,” explained Erica Jong. 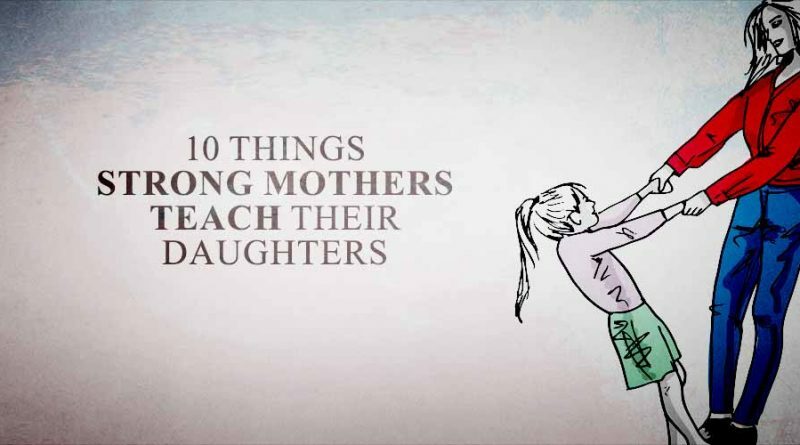 A truly strong mother gives her daughter strength that she, herself, never thought possible. She raises a woman who can fly higher than she ever could. It becomes the greatest joy of her life to watch her soar.